We’ve talked about a lot of musical genres that have their origins in Europe, so today I wanted to switch gears and talk about a genre that has its origin in America – ragtime music. Another reason I was itching to talk about ragtime is that it’s a piano genre, which is obviously what I like to highlight on this channel. Ragtime music (“ragged”, or syncopated), originated in the southern USA at the end of the 19th Century (late 1800s). It enjoyed about 25 years of popularity, until the jazz genre took over around 1920. Today we’re going to talk about what ragtime music is, its origins and precursors, and the main composers of ragtime music – with a few listening examples. Okay, so what exactly is ragtime music? Ragtime music originated on the piano. They music is fast and syncopated (“ragged”), with the right hand doing all the crazy rhythms and the left hand played steadily. In ragtime, the left hand usually plays a bass note on beat 1 and 3, with a chord on beat 2 and 4. Ragtime harmonic patterns are fairly simple, doing a lot of tonic-dominant movement. For example, if you were in the key of C, you would be playing mainly C and G chords. Unlike some jazz, the way ragtime music was written on the page was exactly how it should be played – without embellishment or modification. It has that in common with Classical and Romantic music. Ragtime is also very technically demanding to play – if you’ve attempted to play Joplin’s Maple Leaf Rag, you will understand. The idea was to play with machine-like precision. Though ragtime music spread across America, its central hub was Missouri. There’s an annual Scott Joplin Ragtime Festival in Sedalia, Missouri, because Joplin lived and taught there for a while (in addition to living in St. Louis, Missouri). 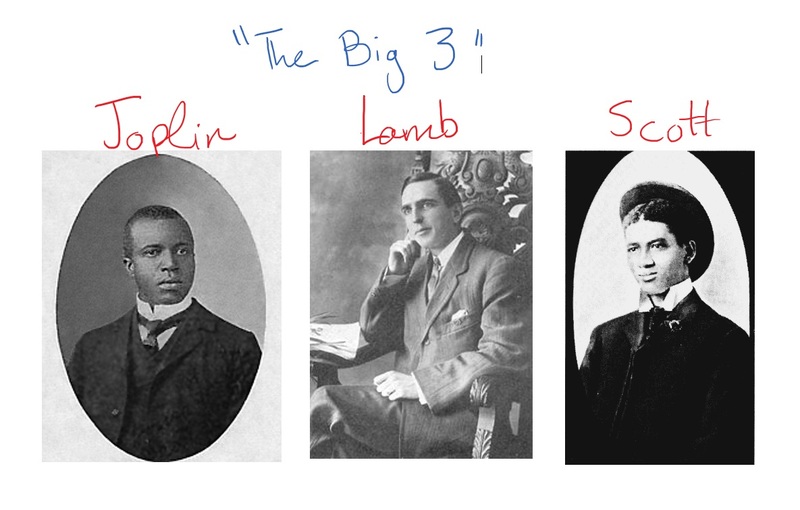 If you haven’t heard of Scott Joplin yet, we’ll be talking about him soon, since he’s the most famous name of ragtime. St. Louis was a popular center for ragtime – since it’s located in central USA, it was a hub for travelers of all kinds, and as a piano player you could make a living there. You wouldn’t be rolling in the dough, perhaps, but you’d make enough to get by. But since music is an ever-evolving beast, with one genre leading into the next, what forms inspired the creation of Ragtime? Ragtime was a transient genre. It was popular before recorded music became available, meaning it was mainly distributed via sheet music – and you’d hear it performed at bars and clubs. It had this in common with Classical music. But the sound of ragtime was evolving away from the Classical sound, and could be seen as a precursor to jazz. With jazz, the musical landscape changed even further in the advent of musical recordings. These were composers who enjoyed popularity and wrote high-level ragtime music (not cheap imitation ragtime). So let’s talk about Scott Joplin. He was an African-American songwriter and piano player, born in 1867 in Texas. He grew up as a railway laborer, but he was lucky to have a musical family and good teachers, because he was able to travel around the south as a musician after deciding that hard physical labor wasn’t his cup of tea. Eventually, in 1894, he moved to Sedalia, Missouri, where he taught piano for a living (and trained future ragtime stars). It was there he started publishing music, and where he got a publishing deal. When he published Maple Leaf Rag in 1899, it became a craze, bringing him fame and influencing other musicians, and the song stood as the definition of ragtime. Let’s listen to a little bit of the famous Maple Leaf Rag. You’ll notice the steady, leaping left hand and the catchy and syncopated right hand. In Sedalia, there was a club called “The Maple Leaf Club” that Joplin frequently went to/played at, so he named one of his most favorite songs, The Maple Leaf Rag, after that club. Joplin moved around some more – to St. Louis and New York – and attempted to break out of the ragtime box by writing operas, without much success. In 1917, Scott Joplin died of syphilis, and his death marked the end of an era – the end of ragtime. Joseph Lamb is the only non-African American of the Big 3. He was born about 20 years after Joplin in New Jersey, and, as a self-taught piano player, was very passionate about Joplin’s music. In 1907, he met Joplin in New York City, and Joplin was impressed with Lamb’s tunes. So Joplin set Lamb up with his own publisher, who he stayed with for a decade. Around the time of Joplin’s death and the end of the ragtime era, Lamb decided to compose music as a hobby, opting to be on the business side of things as an accountant. The song I want to show you by Joseph Lamb is his “Sensation Rag”. This was the one he performed for Scott Joplin in person in 1908, and the tune that caused Joplin to recommend Lamb to his publicist. His rags are lively and organized. Lamb put melody first and technical difficulty second in his writings. His rags aren’t wildly complex (both in playing or listening), but are very accessible and listenable. Last of “The Big 3” is James Scott. He was a talented African-American piano player and composer who lived in Missouri (like Joplin). Like Lamb, James Scott was born about 20 years after Joplin, and considered him an idol. In 1905, he travelled to St. Louis to find Joplin and play some rags for him. And, like the story of Joseph Lamb, Joplin was impressed and recommended James Scott to his publisher. Scott became a music teacher and performer at silent movies, as well as composing. He was fairly successful until sound movies took over in the early 1930s, pushing him out of his theatre jobs. Scott wrote a song called “Frog Legs Rag”, which became a huge hit (not as big as Joplin’s Maple Leaf Rag, but definitely up there). This was one of his earlier compositions, but I figured it would be worth looking at, seeing as it’s one of the most well-known ragtime songs. It also gives a sense of Scott’s clear, bright and lyrical style. Ragtime music wasn’t confined to the USA – European composers, like Dvorak and Debussy, were influenced by it as well. A good example is Debussy’s “Golliwog’s Cakewalk”, written in 1913. Cakewalks were very similar to rags – just an earlier form of them. Like any new and exciting musical genre, not everyone sings its praises. Just like Marilyn Manson in the 1990s, ragtime was considered by some to be “musical poison” and of being able to find its way into the “brains of the youth to such an extent as to arouse one’s suspicions of their sanity”. It just goes to show that, no matter what generation you live in, new music and art will always tend to be considered evil until it becomes common. Though ragtime fell out of popularity around 1920, replaced by the wilder, more adventurous jazz styles, ragtime didn’t disappear into obscurity forever. In the 1970s, ragtime music was revived by performers and movies. One thing that happened to ragtime over the years was that it became caricaturized. You had this art form that was watered down for mass consumption, and then it became parodied for years, so that no one considered it a serious genre of music. Typical impressions of ragtime music would involve playing on an out-of-tune piano, playing way too fast, making lots of mistakes, and so on. But in 1970, a guy named Joshua Rifkin recorded an album called “Piano Rags by Scott Joplin”, approaching it like a Classical pianist and treating the genre with respect. This album became very popular. In 1974, a movie called “The Sting” used the music of Scott Joplin, further revitalizing the genre. This is where Joplin’s song “The Entertainer” became famous. Because of these revitalizing efforts, and many more, ragtime is a genre most of us have heard of even in modern times. To expand on our education of ragtime music, the next video is a simplified tutorial of The Entertainer by Scott Joplin. It’s at around a grade 1 level on the piano, so give it a try if you’d like! I hope you enjoyed this brief history of a more modern style, and I’ll catch you guys next time.